Zimmer, widely regarded as one of the world's most successful film composers (Oscar winner for The Lion King, Grammy winner for The Dark Knight, composer of blockbusters from Gladiator to Inception) offers his secrets in a new four-hour "master class" available online starting today. San Francisco-based MasterClass has been recruiting well-known voices throughout the U.S. to teach various subjects – Aaron Sorkin on screenwriting, Reba McEntire on country music, Kevin Spacey on acting, Steve Martin on comedy, Frank Gehry on architecture and others – but Zimmer is the first to agree to discuss in detail the creation of music for films. He introduced the project at a kickoff event Wednesday night at The London screening room, with a Q&A moderated by VH1's Carrie Keagan (who once worked at Zimmer's Santa Monica studio). "This was remarkably difficult to do," Zimmer said. "Everything I've learned, I learned by doing, or by being around directors, or by being around musicians. The way I communicate is through music. Now, suddenly, I had to put everything into words. I did my best. I went home every night after the shoot more exhausted than I've ever been." Zimmer credited his own mentor, British composer Stanley Myers (The Deer Hunter), with showing him the way. "He was one of the most intelligent human beings I ever met," he said, "but Stanley knew nothing about technology." So when Myers bought a sophisticated Italian espresso maker, Zimmer made coffee "and in exchange, he showed me how the orchestra worked. "He taught me by just letting me in the room," Zimmer added, recalling an early instance when famed director Nicolas Roeg spent hours debating the correct musical approach to a scene. "I saw magic happen," Zimmer said. "By the end of the meeting, there was the possibility of something great." 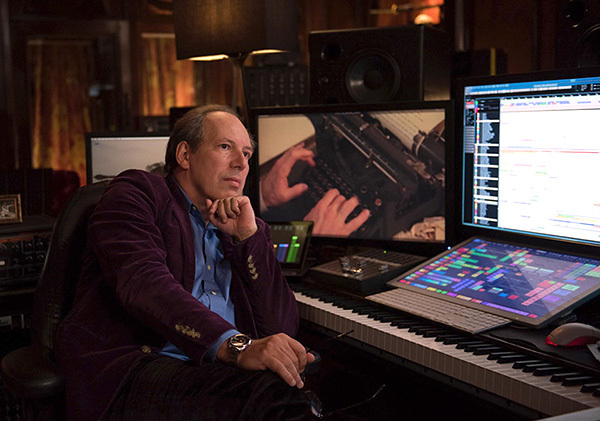 Zimmer has followed in Myers' footsteps by mentoring younger composers at his Remote Control studios, many of whom have gone on to prominence in the film world: Harry Gregson-Williams (The Martian), John Powell (How to Train Your Dragon), Ramin Djawadi (Game of Thrones), Heitor Pereira (Minions), Tom Holkenborg (Deadpool), Steve Jablonski (Transformers) and many others. Recently, he co-founded Bleeding Fingers, a production-music house for the creation of TV music (including the recent Planet Earth II) by up-and-coming young composers. "This seemed like a natural extension of that," he said. Zimmer's MasterClass is broken down into 31 lessons, including the importance of story, the creation of themes, interaction with directors, building unique sound palettes, the use of tempo, working with musicians, the life of a working composer, and specific case studies (including his own scores for Batman Begins, Sherlock Holmes, the Pirates of the Caribbean movies and Frost / Nixon). It is accompanied by a 40-page workbook with assignments and suggestions for further study. He admitted that, after an estimated 150 films, he still struggles with insecurity. "Every movie is terrifying," he said. "I have no idea what to do or how to do it. Fear is a great inspirer and motivator. Just watch out that it doesn't take over and cripple you." And luck sometimes plays a role. He recalled doing a small 1988 movie titled A World Apart. "Nobody saw it except (director) Barry Levinson's wife Diana. The music in that movie touched her. She bought the CD, gave it to Barry and said, 'Listen to this.' He was making Rain Man at the time. He then came through my door and said, 'Hey, would you like to come do a Hollywood movie?' It was as simple as that." Rain Man became Zimmer's first of his 10 Oscar-nominated scores. He is currently working on Christopher Nolan's World War II film Dunkirk (slated for a July 21 release) and will continue the live performances he started last year with appearances in Los Angeles, San Francisco, Las Vegas and the Coachella festival in April. Speaking of his own MasterClass, Zimmer said, "I'm not sure if it's just about music. I think it's about creativity and about life. And the possibility that you don't necessarily have to follow the rules. You can follow your own narrative." And, referring to himself, he added, "this crazy guy with no education from Germany managed to do it." More information is available at www.masterclass.com.